For the past 27 years, President Omar al-Bashir and a small group of ruling elites has transformed Sudan into a violent kleptocracy. This group, as well as their enablers and facilitators, have amassed personal fortunes by looting the country’s considerable natural resource wealth and state assets. Attempts to disrupt the looting machine or hold government officials accountable are met with state violence and severe repression. Armed conflict and mass atrocities drew the world’s attention to Darfur in 2003 and 2004. This conflict – which the United States government characterized as genocide in 2004 – resulted in the death of perhaps 300,000 people and the displacement of millions more. In 2009 the International Criminal Court issued a warrant for the arrest of Bashir, as well as several other government officials, and charged them with crimes against humanity. Prior to the conflict in Darfur, the Bashir government oversaw a bloody civil war between the North and South of Sudan. In 2005, combatants signed the Comprehensive Peace Agreement (CPA), which ended the Second Sudanese Civil War (1983–2005). The CPA also allowed a six-year period for the people of southern Sudan to determine whether they wished to remain part of Sudan. 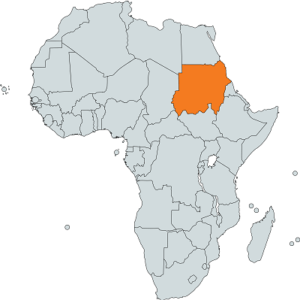 In 2011, Southern Sudan voted overwhelmingly to secede from Sudan, forming the independent country of South Sudan. That year also saw a new armed conflict emerge between the Government of Sudan and armed groups within South Kordofan and Blue Nile, two states bordering the new international border with South Sudan. The secession of South Sudan caused a severe economic shock in Sudan, as the country lost nearly 75 percent of its oil reserves and 95 percent of its foreign currency reserves. Since 2011, the Sudanese government has continued to use severe repression and violence to neutralize political opposition and civil society, especially as the gross mismanagement of the country’s economy becomes a rallying point for protests and dissent. In 2017, Sudan remains mired by three active armed conflicts, a terrible human rights record, and recognition as one of the most corrupt countries in the world. An estimated 2.6 million people remain displaced in Darfur, as intermittent violence continues. In addition to conflict, political repression and public corruption continue to undermine peace and prosperity throughout Sudan. In the first days of 2017, gunmen opened fire on civilians in Nierteti in Central Darfur resulting in multiple deaths and injuries. Local reports varied, listing between two and eight people killed and between 39 and 60 people injured. The same week, an armed confrontation over stolen livestock resulted in the death of seven people and injuries to another eleven in El Geneina in West Darfur. Later in January, Transparency International named Sudan one of the ten most corrupt states in the world, ranking it as 170 out of 176 countries on its annual Corruptions Perceptions Index. While the Sudanese government continues publicly to publicly affirm its commitment of a ceasefire in Darfur, South Kordofan, and Blue Nile, the Sudan People’s Liberation Movement-North (SPLM-N) accuses the Sudan Armed Forces of breaking this ceasefire and attacking its positions on at least three occasions. On February 21, the SPLM-N claimed that the government began its dry season offensive in coordinated attacks in Kadugli County. The Sudanese government has rejected these claims. Concerns over the Sudanese government’s engagement with the European Union for the purpose of stemming irregular migration via Sudan to Europe continue to mount as this support could potentially help fund the repressive policies of the Sudanese government. Most recently, Sudanese police sentenced about 65 asylum seekers to 40 lashes. The government also imposed onerous fines and deported numerous asylum seekers without due process or a fair hearing. The lashed asylum seekers were denied medical access. The South Sudan crisis also continues to affect Sudan. At least 32,000 South Sudanese have fled to Sudan in 2017, according to the UNHCR. Finally, in often-overlooked East Sudan, eight people have died and hundreds are ill due to a suspected cholera outbreak. The Sudanese government has not issued a statement addressing this issue, but Sudanese doctors report government efforts to misrepresent the outbreak as acute watery diarrhea. The most significant political development is the conditional easing of U.S. sanctions toward Sudan. This decision upended a 20-year U.S. policy, resulting in significant criticism from members of the U.S. Congress, human rights groups, and Sudanese opposition leaders. On January 13, the U.S. government announced a six-month temporary easing of some U.S. sanctions toward Sudan through an Executive Order issued by the Obama Administration. The Executive Order requires the Trump administration to determine if the Government of Sudan has made significant improvements on five issues enumerated in the Executive Order. If so, it instructs for the permanent lifting of the sanctions. Human rights organizations and Sudanese opposition leaders decried this order, arguing that conditions within Sudan have changed very little and do not justify such a sweeping pronouncement. The Sudan Call and the National Umma Party, led by former Sudanese Prime Minister Sadiq al-Mahdi have called for the permanent easing of sanctions to require that the government demonstrate a greater commitment to internal reform. Political repression and intimidation continue. In January, news about how the National Intelligence and Security Service has harassed, tortured, and killed Darfuri students over the past three years, emerged. Likewise, on February 5, security forces detained the Chairperson of the independent Central Committee of Sudanese Doctors. This committee staged a number of successful demonstrations in late 2016 to draw attention to poor working conditions and a lack of medicine and supplies for Sudanese patients. On February 10, the UN Independent Expert on the Situation of Human Rights in the Sudan, Aristide Nononsi, began a 12-day visit to Sudan. Nononsi planned to visit the Sorotony IDP camp in North Darfur and El Geneina. He also promised to raise the issue of unlawful political detentions to the government. To advance U.S. national security and economic interests, the Enough Project recommends the increased use of financial pressure policy tools on regime elites, as well as their enablers and facilitators. Deployed effectively, these tools will allow U.S. officials to regain leverage over Sudanese decision-makers to further a strategy focused on reviving efforts at comprehensive peace. Without this leverage, there is little reason to believe that the Bashir regime will make meaningful concessions toward lasting peace or that the United States will achieve important national security objectives. To restore its advantage when engaging Sudan, the U.S. government should revoke the Obama executive order and replace it with enhanced anti-money laundering measures and modernized sanctions. After regaining leverage for future negotiations, the United States should help facilitate a revitalized peace process that is both comprehensive and inclusive.